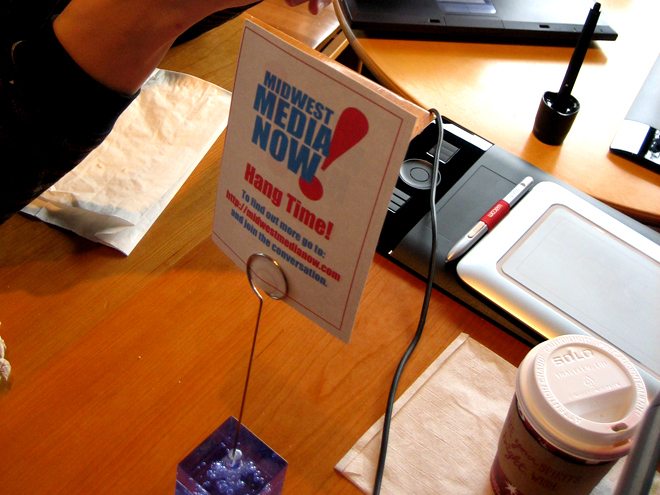 Wednesdays @ Starbucks – Midwest Media Now! What’s Wednesdays @Starbucks? Starting around 8am every Wednesday we gather to share, collaborate or just find out what’s new in NEW media. It goes for about 2 hours but some stick around longer depending on peoples schedules. Since we are talking new media, you don’t have to live in Chicago or be out in the burbs to join us. If you have a Skype or Twitter account you can join in on the fun too. Just drop us a line and we’ll pipe you in! Just some of the things we are doing. If you’re a small business owner or entrepreneur and are looking for way to use social or new media drop by we are always talking about this stuff who knows you might find someone here to help you out. We are also trying out group projects and we are always open to new ideas. If you think you have something to share and you’re a content creator then you should be here. Some days when we have special guests drop by and we set up the mics and record podcast right in the middle of Starbucks. If you find yourself in @Starbucks on Wed around 8am look for this sign then you’ll know you’ve found our group. We’re all very friendly and we like talking media. Every Wednesday you can find someone from Midwest Media Now at Starbucks. You can find us here. Here’s our Calender of coolness, if you have something you want to talk about or try in the new media world drop us a line.